As true professionals from a large and medium format film background, Justin and Alex bring years of photo-manipulation tips and tricks to their training. When I first met Justin Masse in the mid 90's he worked for a major design firm in Calgary (Creative Intelligence Agency), art directing photo shoots for their print ad campaigns. Over the years, I've called on Justin's amazing photography and design skills for more than a few projects! Early in 2007 I was visiting Justin and his partner Alexandria Markowsky's studio, and we got to talking about Aperture, and how it's revolutionized their production workflow. Looking around the studio at the extensive selection of commercial equipment, it dawned on me that there could be no better trainers for our Aperture courseware than this dynamic duo of true professionals that use Aperture every day to store, organize, and retouch photos. In their professional lives, Justin and Alex run a fine art and commercial photography studio in British Columbia Canada. This duo is now working on many projects together including fine art installations and commercial project's. Justin's long history as an Art Director, Designer and Photographer for many national level clients combined with Alexandria's years of experience in Fine Art photography creates an exciting combination. Justin and Alex utilize a variety of tools to get the job done, from large and medium format film, to digital capture. "We are always striving to stay on top of cutting edge technology in a quick changing market, instead of fearing change we embrace it." Although no strangers to noxious darkroom fumes, their switch to an all digital darkroom system has been huge for their productivity. "Now that we are experts in the digital realm, we can get the best from our film as well as digital capture, combining the two allows more creative possibilities without loosing the warmth and feel of film." All this experience certainly shows in their tutorial videos. I'm very pleased to list Justin and Alex amoung our profesional roster of trainers here at macProVideo.com! It took me quite a while before buying the Aperture 2 tutorial. I was waiting for the 3 version. Also I tought that I would have enough information to work with Aperture since I took the 6 hours course provided at The Apple Store. I did realize soon enough that the amount of information to keep in mind is so big that you forget half of it when you have to work with it. It is where your tutorials are fantastics. You can come back to the exact information that you need because the titles are precises and clear. Also you can go at your pace. I usually have a first hearing and go back after to what I need.I still regret to not have the version 3 but I can adapt. So much is covered and in a simple way. I recommend your services to friends and have been very satisfied to what you have produce so far. 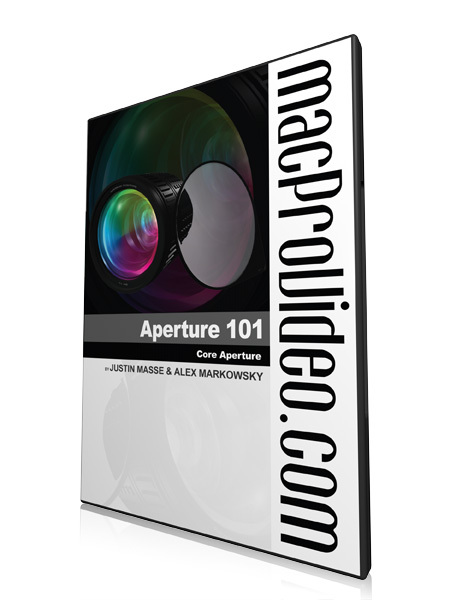 Very good tutorial on aperture. Look forward to course 201. Just finished the long tutorial. Fantastic, I'm sure now I'll get the most out of Aperture. Thanks Alex & Justin. It was a great introduction to the Aperture. I just wish there was a intermediate or advanced version to learn the more advanced applications of Aperture. The only suggestion I have is to shorten the corporate introductions, after an hour or so the intro's became VERY repetitive. Every tutorial I have purchased from Macprovideo has been first class and much more fun than reading a user manual. Loved it. 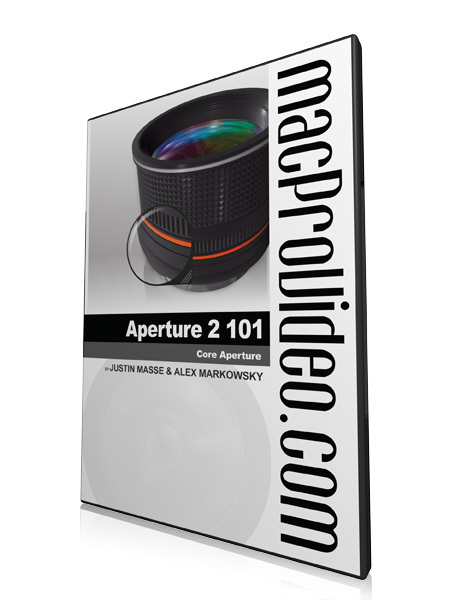 Looking forward to a more advanced video on aperture. Although I'm not a pro photographer, not even close to that, I rely a lot on Aperture to give my photos a more professional look. The problem is, photography is not what I do for living, and there's not that much time to learn a beast like Aperture by myself, so that's when MacProVideo tutorials come in. In just a couple weeks, I went from a "what's this" to "this is how you do it" behavior. Absolutely great tutorials! Love them.